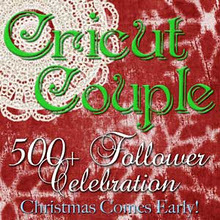 Cricut Couple, Bobby and Jill, are having a BIG celebration over at their blog with great ideas and awesome giveaways. Be sure to check out all of the fun-click HERE!! Awe... Thanks so much Ally! This has been so much fun! You have to come by when you can and read some of the Christmas stories in the comments. They are all so much fun to read! This has been so wonderful! Wouldn't trade it for anything!